'Thank you for your willingness to serve with us at All God’s People! We are so excited for you to join us in the wonderful experience of serving those in need. Truly, it takes a compassionate heart to be the hands and feet of Jesus and we are so glad you wish to share this experience with us. All sorting is done at our warehouse. Please contact AllGodsPeopleChicago@gmail.com to sign up for this LARGE part of our ministry. Donations: We are always looking for donations of non perishable food items, clothing and toiletries, food for the meal we provide on our serving day, as well as monetary donations. We also have specific needs arise as part of our wish list items. These donation requests can be found on our Wish List Items page. Any donations you can give and/or collect are much appreciated! All donations should be delivered to our warehouse, during the designated sorting times. You can also check out our donations page for our most pressing needs. For more information, you may contact AllGodsPeopleChicago@gmail.com. Food: As part of our serving downtown, we provide a meal for our homeless friends to eat that day. We have also started a part of the ministry that we call 'The Pantry'. This is a collection of non perishable food items available for our homeless friends to take with them. Examples of non-perishables offered are: soup (in pop-top cans), tuna, spaghettios, canned fruit and vegetables, individually packaged crackers, and pudding cups. (Most of our homeless friends will use small burners to heat these items, which is why cans with no need of a can opener are best). We rely on volunteers to supply the food, and we would love for you to help in this area! This would include anyone willing to cook or bake part of the meal served downtown, as well as donations to 'The Pantry'. Please contact AllGodsPeopleChicago@gmail.com for more information on the food items needed for each month. Serving Downtown: This is our most popular area to serve! Due to the high response in this area, we have a policy in place that allows volunteers to be rotated on a 4-month basis (all volunteers are able to serve once every 4 months. Be sure to sign up each time!) We also strongly recommend all volunteers to participate in sorting and/or other areas before serving downtown. This allows you to become familiar with the ministry of All God’s People, and gives everyone a chance to serve downtown with us. 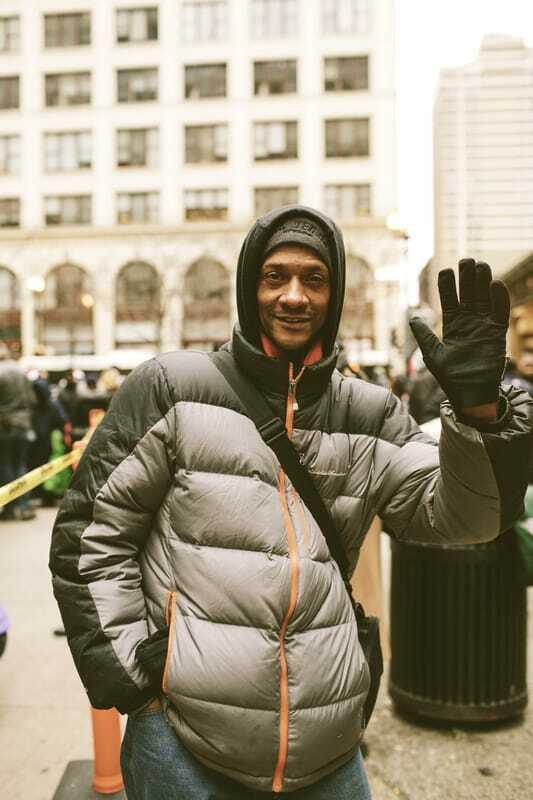 When serving downtown, our team for the day will meet at the All God’s People warehouse at 12:15 before heading to our location downtown at 2431 South State Street. We love to see new faces serving with us downtown and look forward to seeing you! Training is another step in becoming a volunteer who serves downtown. The training is done the day of serving, at the warehouse. Please be at the warehouse at 12:15 on your serving day to ensure you receive the training! During this time you will also be told what to expect, who to report to, and where, what and how we will be serving that day. We like to have everyone prepared when serving downtown to ensure an effective serving experience for all! Would you like to help? Sign up here! Please "Like" us and spread the word!